Below is a note received from Mark Lange, the Colorado County Wildlife Biologist and CCWMA to all members of Oakridge Ranch WMA. Just a couple quick reminders this morning as the general season opener is fast approaching. 1) CCWMA leadership would like to remind you that If you haven’t already joined the whitetail contest, please try to do so before November 5th. Your $15 entry fee puts you in the running for the $9,100 in prizes. We are really urging you to get your kids involved (deadline October 29th for youth). A complete contest entry form can be found on www.ccwma.org on the home page. You can mail your entry to Mickey Mangum or drop it by my office and I will get it to him. 2) Like I discussed at the meetings and to everyone that has come to my office for tags, the CWD testing efforts are still on-going and will be for years to come. I would greatly appreciate your assistance in my efforts to collect samples. After you harvest any adult deer, simply save the head on ice and contact me at my office or via email (Mark.Lange@tpwd.texas.gov). I will be checking my phone at the office for at least the first two weekends of general season so just leave me a message and I will return your call ASAP. Attached is the flyer from Texas A&M AgriLife Extension Service for a workshop being offered on Whitetail Deer, October 29, 2016 here in Colorado County. Hope you can attend! Young Buck; Photo by B.LaVergne, 09-24-2013. 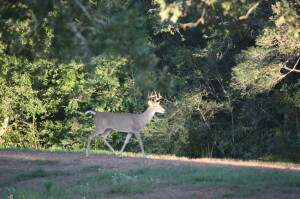 This young, healthy buck is a nice example of one to pass on during this hunting season. This buck appears to be approximately 2 1/2 years old and is a nice 8-pointer; but he is illegal in Colorado County, Texas. As you can see, this fellow does not have a 13-inch spread on the antlers. He’ll pass on some good genes to the next generation(s). Remember to closely check out your deer when deciding which one to harvest. Study your herd. Consider taking does first and early in the season. 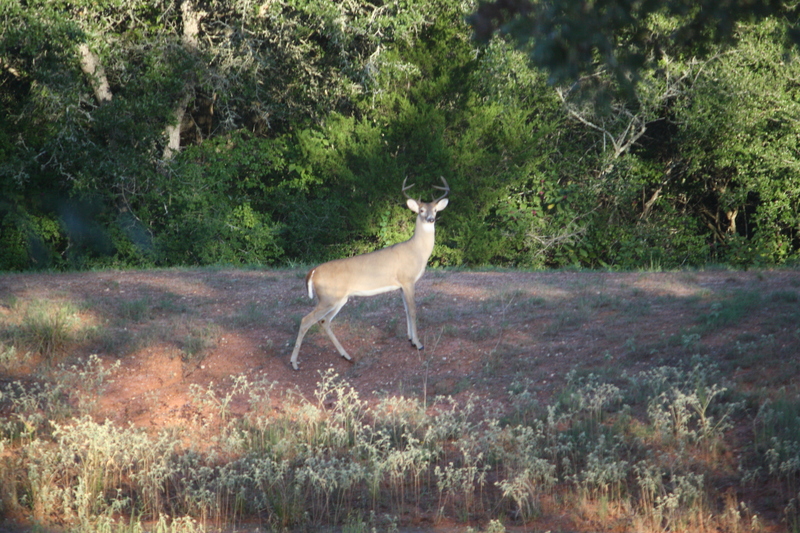 TPWD biologists tell us we need to take many more does that bucks this year as the doe-to-buck ratio at Oakridge Ranch is too high. Be sure to contact David Mitchem, 979-484-9240, to get your doe tags. Here’s another look at this young gent. Enjoy! And as always, live life outdoors! Here’s a picture of Will Carr with his first buck of the 2013 Bow season. Will decided to have the head mounted since this is such a nice beautiful buck that field dressed at 126 pounds. Congratulations, Will on a nice deer! Note: This is an Oakridge Ranch deer. The Carr’s place is off Miller Creek Loop. 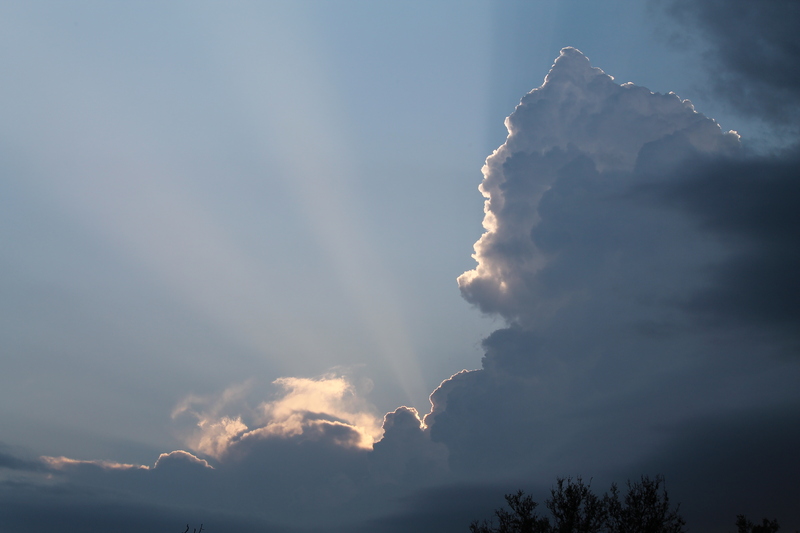 Thanks to the Carrs for allowing us to share this photo. We hope you plan to join us for our Annual Fall Meeting will be September 21st, 10:00 AM, at the Stevenson’s barn. Doe permits will be issued. 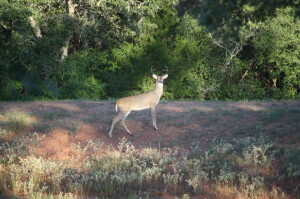 Colorado County Whitetail Contest entry forms will be available. David Mitchem will discuss ORWMA’s own Oakridge Ranch Whitetail Contest. Annual ORWMA dues will be collected and membership forms will be available for completion to help us update our records. Let’s begin now for a great Whitetail Deer harvest at Oakridge Ranch! Live life Outdoors! Bucks in velvet at feeder; Photo Courtesy of C.Stevenson, date unknown.